Fresh vs. Frozen: Which is best? Most would find it appealing to purchase the brightly colored fresh fruits and vegetables displayed in the grocery store rather than the less appealing frozen, plastic wrapped fruits and vegetables. Many shoppers don’t even take into consideration if there is a difference between fresh and frozen fruits and vegetables. Little do they know, there is a significant difference between those appealing pieces of produce and those cold, darkened frozen vegetables. Based on studies performed on the nutritive value of fresh and frozen produce, there were multiple cases in which there were more antioxidants in frozen fruits and vegetables when compared to antioxidant levels in fresh produce that were kept in the refrigerator for a couple of days (Marinos). Some of these important antioxidants included vitamin C, beta carotene, polyphenols, and lutein (Marinos). Those are only just a few of the many important nutrients that can be obtained from fruits and vegetables. How is it possible to have processed fruits and veggies be more nutritious than the real deal? Turns out the secret goes all the way back to the farm in the harvesting and packaging process. The process of harvesting fruits and vegetables is different for fresh and frozen. Frozen fruits and vegetables are picked at their absolute peak of ripeness. This means that it has been fully developed and its nutritional value is at its peak (Dreifke). From there the produce must be blanched in order to kill any bacteria and stop enzymes that may cause further degradation. Despite that some water-soluble nutrients, such as vitamin C and B, may leach out during the blanching process, frozen vegetables still contain a high amount of nutrients (Driefke). Followed by the blanching process is the flash-freezing process in which the produce is frozen to be packaged and shipped. The flash-freezing process freezes produce in its ripest stage which is the key to keeping produce from degrading and losing nutritive value. Once purchased, keep in mind to store your frozen fruits and veggies properly. Excessive oxidation can lead to eventual nutrient loss of your frozen produce, so make sure to check any expiration dates and eat within that date (Dreifke). The process of picking fresh produce involves neither blanching nor freezing. Fresh produce is picked before it has ripened. This means that the produce has not had time to fully develop and reach its peak ripeness. This is done so that the produce can last the transportation process from farm to store. You may think that fruits still ripen once they reach the store and would be nutrient rich by the time we consume them, however, that is not the case. The fruits picked pre-ripened will never have the same nutritive value as those that are picked when fully ripe (Gorman). This is because they did not experience as long of time absorbing vitamins and minerals provided by the soil for adequate growth. Additionally, during the transportation process produce may be exposed to all different kinds of temperatures and lighting which can cause degradation of vitamins that are sensitive to such factors. Sometimes these exposures can even affect the taste and texture of the produce (Barrett). It is still very important to consume fresh fruits and vegetables daily as part of a healthy diet and should never be excluded. But if you’re looking to get a bigger bang for your buck or trying to cut back on cooking time, go purchase some highly nutritious frozen produce for a few meals. Barrett, Rhianon. “True or False: Fresh Food Is Better Than Frozen or Canned Food.” EBSCO, 2008. Web. Dreifke, Sarah. “Myth or Fact: Fresh Produce Is More Nutritious Than Frozen Produce.” Fit Day. Internet Brands, Inc., 2012. Web. Gorman, Rachael. “Fresh vs. Frozen Vegetables: Are We Giving up Nutrition for Convenience?” Eating Well. Meredith Corporation, 2007. Web. Marinos, Sara. 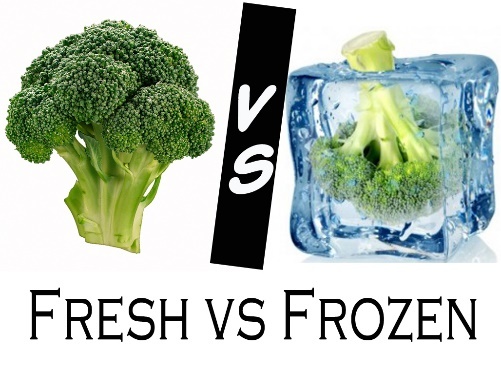 “Fresh vs Frozen Food: Which Is Best?” Body and Soul. News Life Media, 2015. Web.